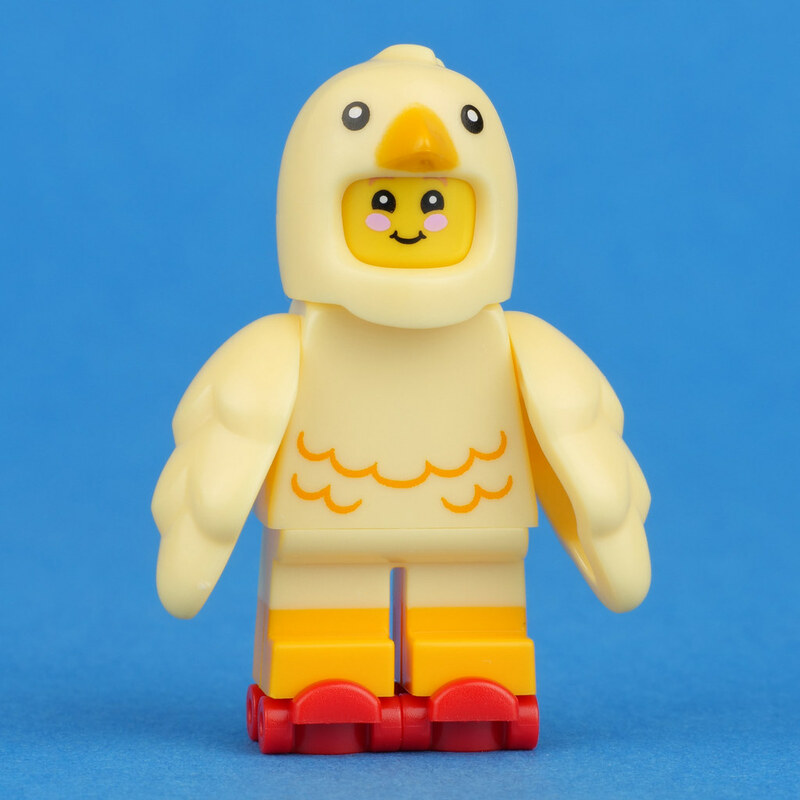 The latest gift with purchase promotion at shop.LEGO.com and in brand stores in the USA and Canada starts today - it's 853958 Chicken Skater Pod. In the U.S. it comes with a purchase of $35. It includes a little girl in a chicken suit and a bunny, both of which are suitable for Easter, which is just around the corner. I'm not entirely sure how or why roller skates are involved, but let's take a look inside the pod. 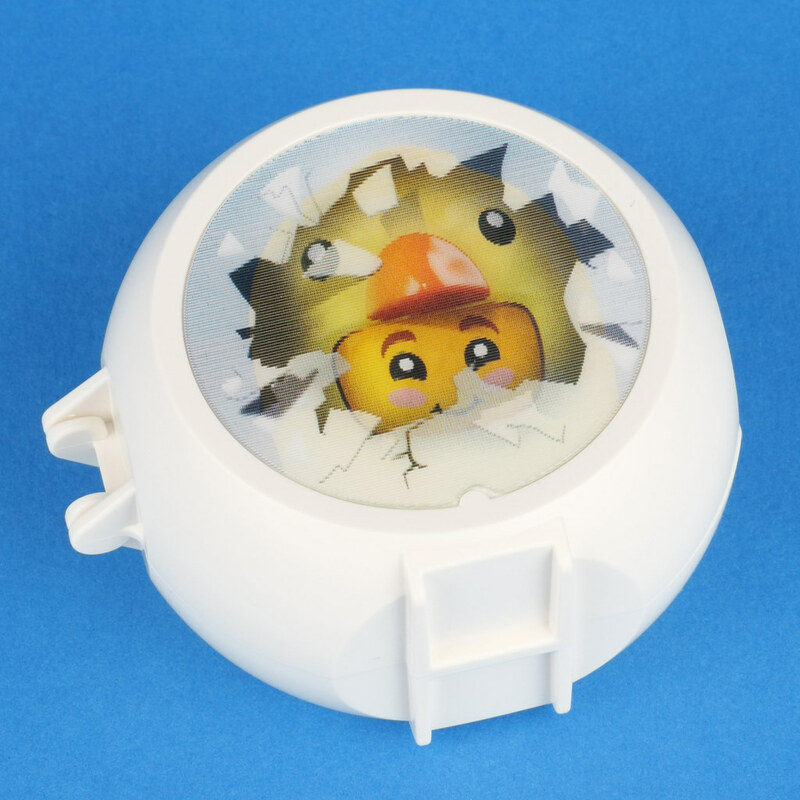 The pod comes in a polybag, and upon opening the polybag there's only the pod and the instruction sheet. 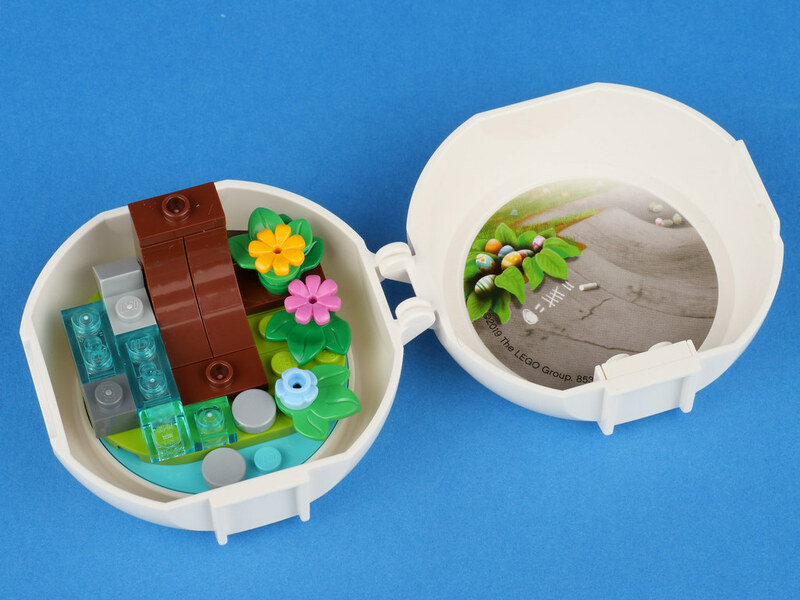 All the pieces to build the scene are in a single bag inside the pod. The pod has a lenticular image on the top. From one angle the sticker looks like a chick hatching from its shell - the colour of the pod makes sense now. From another angle you can see the chick fully "hatched" and the little girl peering out. The minifig is a little girl. 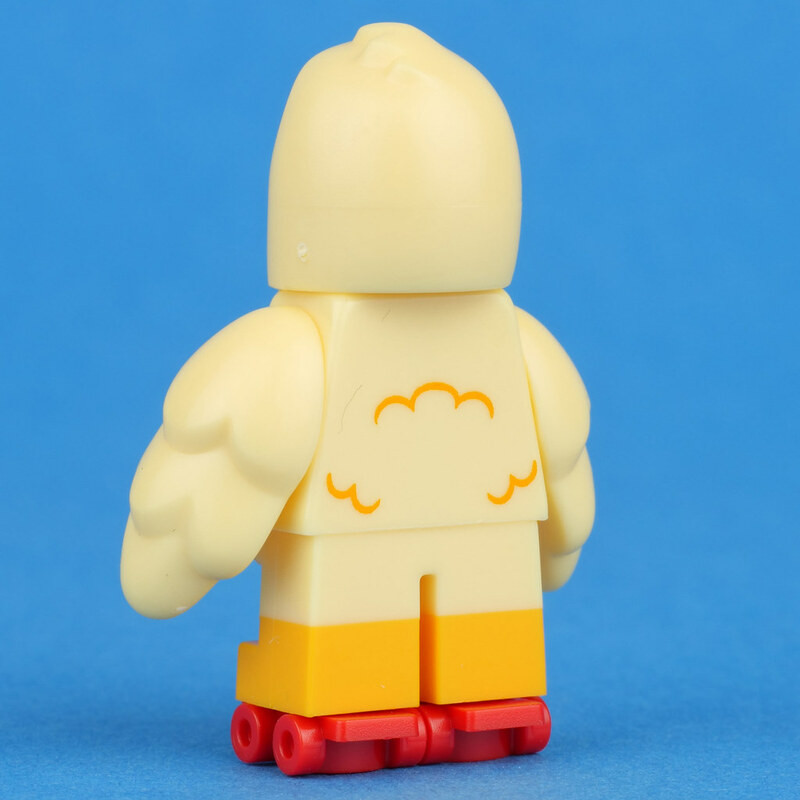 Her costume is in my favourite LEGO colour, pale yellow. She has a lovely smile accentuated by the pink colour in her cheeks. There's nice feather detailing on the front and back of her torso, and her winged arms look great. She's decked out here with her roller skates, in a nice bright red for this set. I love the dual colour of her legs. The bunny is (as required) very cute, down to the little pink nose. 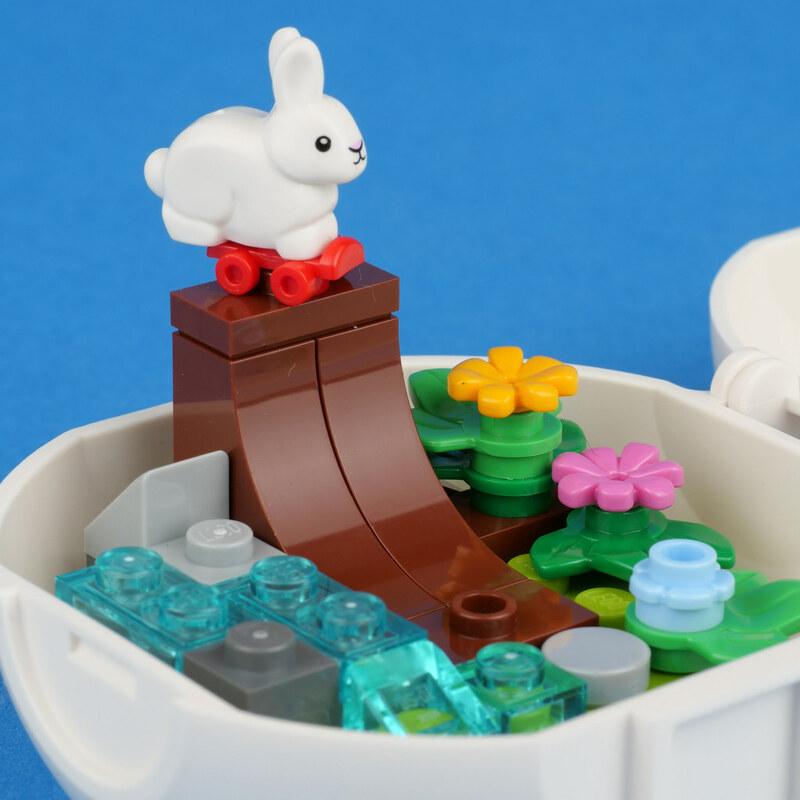 I've seen many bunnies in many Friends sets, but I don't remember seeing one that has an angled face like this one. 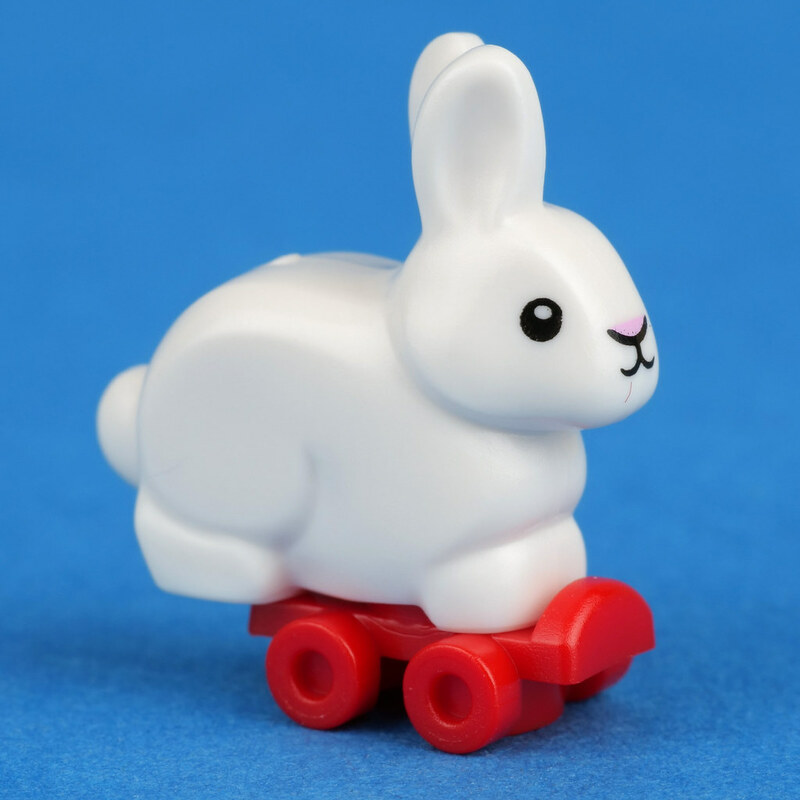 This is one talented bunny as it also has a roller skate, though seeing as it's only one, perhaps it's a skateboard? There's a small scene that can be built on one side of the pod. A blue 6x6 round plate is fixed on the bottom of one side of the pod and the nature scene is built on top of that. It features the skate ramp, but features some nice greenery (using two colours of the new leaves) and some transparent blue pieces to add to the water feature. A sticker on the other side of the pod shows the current score between the bunny and the little girl. 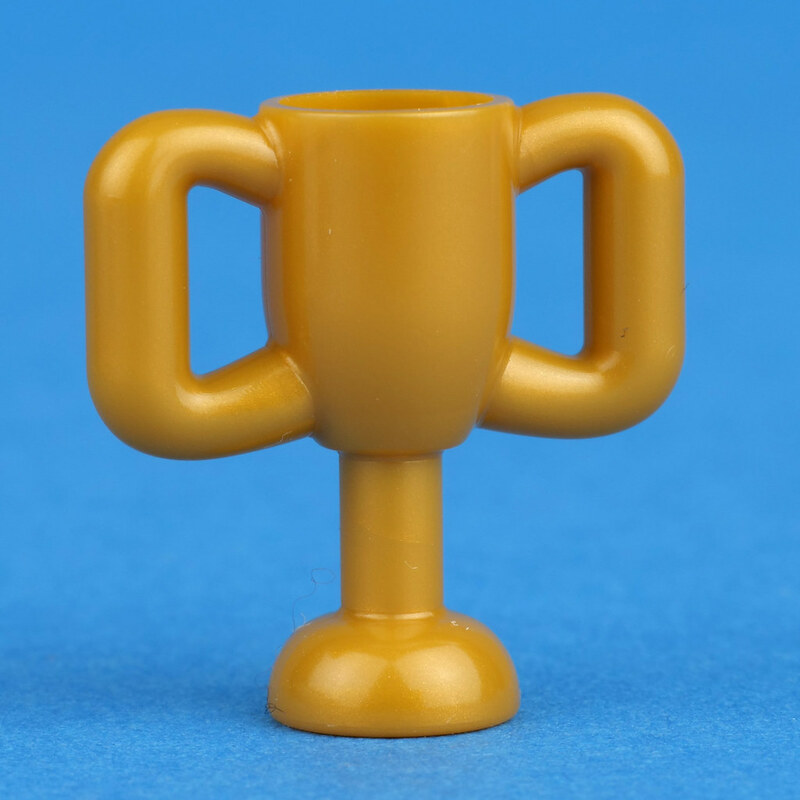 Winner of the contest wins the trophy that's included! Jumper plates at the top and bottom of the ramp allow the skaters to show off their moves. There's a spot on the sticker side of the pod for the little girl to perch on. The entire set is constructed so that the pod can be fully closed. One item of note is that there are no spare pieces included in this set - something that was a first for me. I expect most people will be solely interested in the minifig included in this set, and it's quite nice. The bunny is suitably cute as well. 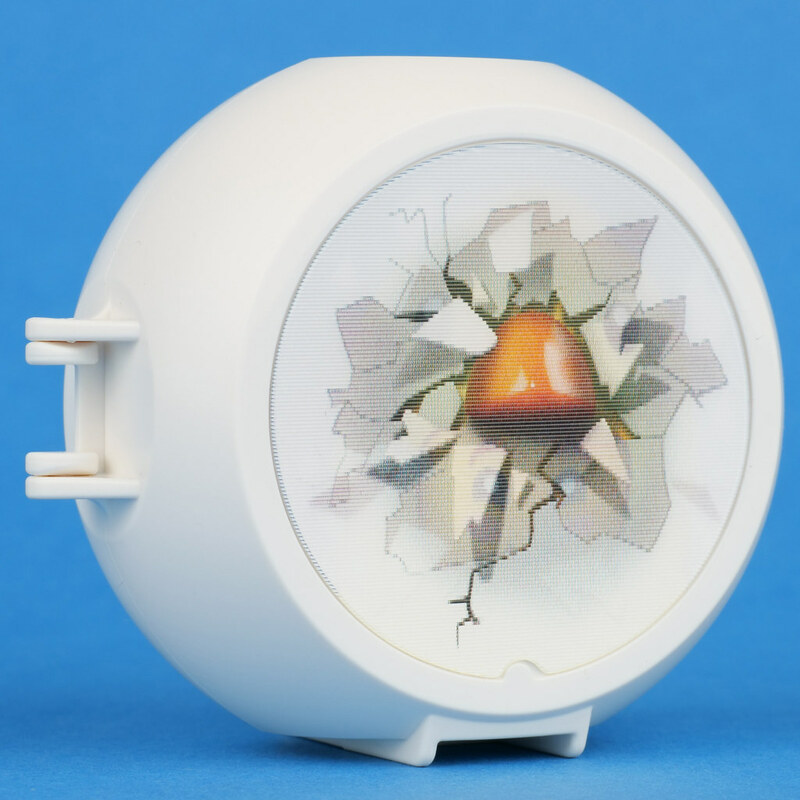 Considering the space is so limited, the designer has managed to fit quite a bit of detail in the little nature scene on one side of the pod. Having the set in the pod makes it quite portable and is ideal for a child to carry around to keep themselves occupied. Many thanks to Huw for the fantastic pictures! 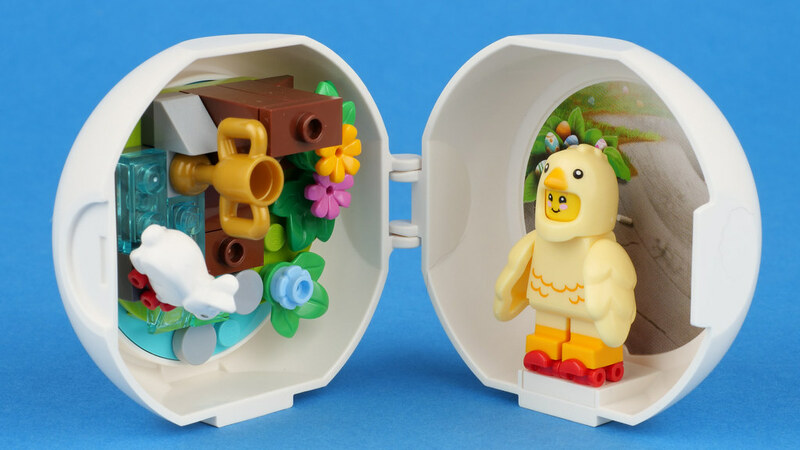 853958 Chicken Skater Pod is currently the gift with purchase at shop.LEGO.com until April 22. This set was provided by LEGO for us to review. All expressed opinions are my own. Thats a boy. It has no eyelashes. 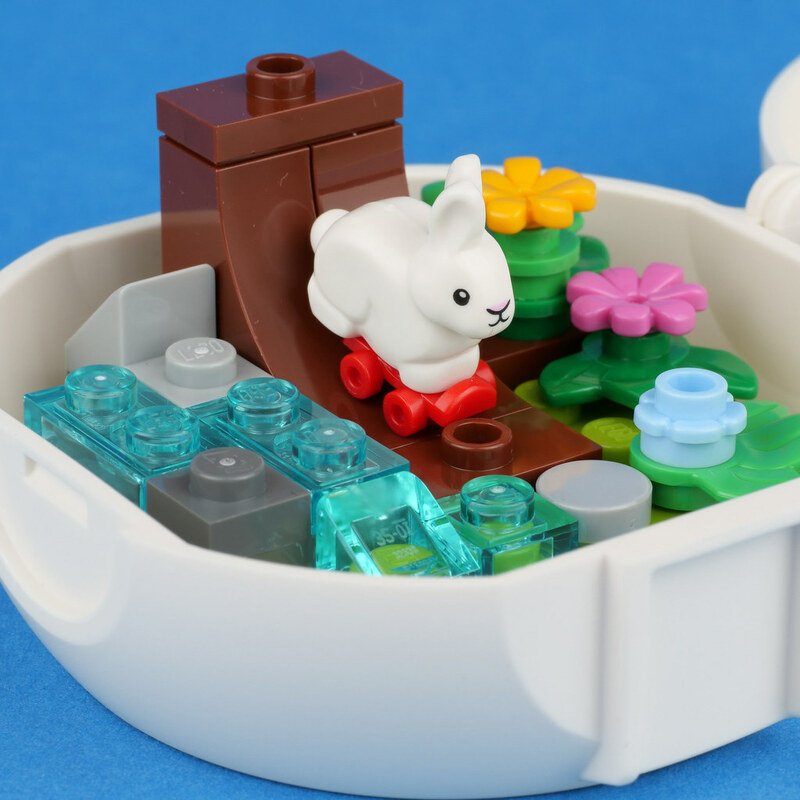 The rabbit was first released with Vet minifigure from CMFs. The pod is amazing. Hope we will get christmas one as well! Great little set, if you got two you could swap one head to a male head so theres one of each, also the parts included in the pod are cute colourful and will prove useful in other creations, Might also pick up the chick brickhead..
Great review, though I'm pretty sure the figure is a boy based on the lack of eyelashes. It looks androgynous to me. So happy to know it’s in Canada! Now to pick out a fifty dollar thing and get me a popcorn bird! Great review. Am I the only one confused by a skater bunny? The chick figure is pretty good. Nice use of the penguin element. Everyone saying the kid is a boy because it "lacks eyelashes." The original LEGO Smile was a genderless representation of a human being. It didn't have any eyelashes. Girls and real life don't always have larger eyelashes than boys. LEGO likes to make neutral characters so people can fill in the gaps about their backstories and character traits, if MeganL thinks it looks like a little girl then by all means she's allowed to call it a little girl! I also think it looks like a boy, but calling MeganL out for being "wrong" about the gender of a purposefully androgynous character with no official backstory is silly. ^I agree with what you’re saying, but Huw—in the comments—said it could be either gender; MeganL is the author of this article. Androgynous LEGO piece?!?! NOOOOOO!!!!! That's not possible! I think it's a non-binary face. Not to be controversial, but rabbits don't even lay eggs. Not even the girl ones with eyelashes. Costume is cute but I never really liked those style of arms with no hands. I like these pods better than the Brickheadz imo. I think that the chick costume looks adorable as well as that skateboarding rabbit. I hope we get a Christmas themed one! Received it right today with order of Vonreg's Tie and Black Ace. This gift is a good idea, it's so cute, detailed, colorful, delightful. My daughter loves it, it is her first rabbit with this mold. 20/20 for me. It looks too much like a boy to be called a girl. He's a boy. Look at the lenticular sticker- he has eyelashes! I got my order placed for this one plus the free bunny figure advertised on Facebook! This is so sweet I feel I have been given an Easter Egg sugar high without even having to eat any chocolate. I love this little set so much. hmmm, I was also sure its a girl... Then I saw that there were no traditional eyelashes. I guess that it's up to one's imagenation!